I’ve heard some say that it’s much easier to live with a sovereign Lord because no matter your decision it is the Lord’s will. “Nothing happens outside the Lord’s will,” I hear over and over again. And I believe, I guess. But I also must say I believe it’s actually harder to live with, because your trust in him is paramount. It’s hard for me to accept that the Lord’s will was for this to happen or for this to happen. Any good reformer will say that it’s our sin nature that causes it. So God is responsible for only the good stuff and not the really heinous stuff? I know where I could be headed with this isn’t good. But I do feel, at time, the neccecisity of pointing out the other side of the theological tension here.To ignore it is to ignore one of the greatest gifts God gave us: our minds. But what this post is about (actually, what most of my posts are about) is the heart. The unrest of the heart that kind either be about my own fear or about the Spirit moving. Whenever I find myself in a situation where I realize how I need to trust God, I am troubled. Troubled because I find it so much easier to not trust him and rather, trust myself. This is a very dangerous place to be as his child, and I’m realizing more and more that’s it’s even more dangerous when you are in the vocation of ministry. Two weeks ago I attended our Presbytery latest meeting, where the speaking (Joan Gray) spoke about Sailboat Christianity. She asked us, “Are we rowing the boat ourselves? Or are we allowing the Holy Spirit to blow the boat in whatever direction he sees fit.” These are tough question to ask ourselves, because to admit one is to admit you don’t trust God. I’ve had to do some of that (the trusting) of late, especially as I faced a decision – to come to Arizona or choose something else. To choose something else who have been just as much of a leap of faith and choosing to go, but it doesn’t always seem like that (to yourselves or maybe even to others). What I am now looking for is some way to me to measure this. I know it sounds crazy, but i don’t know that I truly recognized the depth of my lack if trust in God. Actually, I do think I trust God. I just trust myself more. And what a terrible, awful place to be – in a place where you trust the fallible more than the infallible. Yet I find it much easier to blame the unrest I sometimes feel on the Spirit, rather than just admitting I am afraid. Father, I pray for your guidance and your guidance alone. Allow me to understand when I’m trusting myself more than you, and not trusting you enough. Stop me cold in my tracks, if need be, if I ever step outside your will. Amen. amen. well said…i've been wrestling with these same thoughts for awhile now. 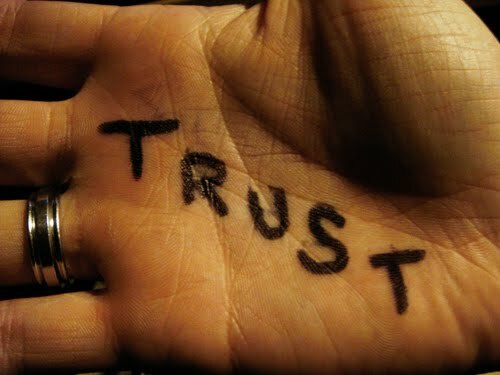 it is kind of shocking–the moment you realize you have trust issues w/ God. but, i can find comfort in knowing it doesn't scare him off. He is the best friend i could have. through all my trust issues, there haven't been many friends that haven't been affected. but, He is steadfast. ready to love me however I need. He isn't affected by me figuring things out & setting up new boundaries…I just hear him whispering to come close…when I am ready. I just love Him. He is awfully sweet. Good stuff Stephanie (as always)! Sometimes I see what you have described as a battle between the head and the heart.. and whichever we have fed and exercised the most exerts the most influence over our decisions and ultimately our pathways. i agree with both of you! my heart and head do often collide, and I think for me I recognize that my own distrust in him often comes down to me own desire for control. Ugh. when will i ever learn? when i try to control things just get messy!